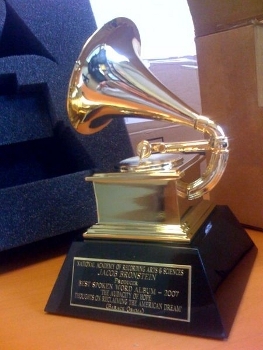 Four Grammy awards have been amended to encourage submissions from the video game industry. The current generation's videogame soundtracks often result from the same compositional and orchestral work as their television and movie counterparts, but they haven't typically been recognized as such. This may change with the future of the Grammy Awards, as The Recording Academy has seen fit to specifically add videogames to the descriptions of four awards. Funnily enough, a videogame song actually won at the 53rd Grammy Awards which took place in February 2011. However, it was a stealth win. Christopher Tin's "Baba Yetu" won a Grammy for "Best Instrumental Arrangement Accompanying Vocalist(s)" due to its inclusion on his 2009 album Calling All Dawns, but it was originally composed as a theme song for Civilization IV. The win may have made The Recording Academy reconsider what types of submissions should be accepted for the Grammys. Recording Academy awards vice president Bill Freimuth told IndustryGamers: "I think this could be viewed as a first step in the direction of video games getting their own category. Many people from the game community have been asking us to create a special category for games over the years, but the main reason we haven't is because we have received very few entries from game publishers." The descriptors for "Best Music for Visual Media," "Best Compilation Soundtrack for Visual Media," "Best Score Soundtrack for Visual Media," and "Best Song Written for Visual Media" were altered from "Motion, Television, or Other Visual Media" to "Motion, Television, Video Game Music, or Other Visual Media." Worldwide executive of music at Electronic Arts Steve Schnur says the change "acknowledges that film, TV and games can stand side by side and be independently recognized," and he predicts the academy will receive many new videogame music submissions in the coming years. Schnur also believes that the change is a move to recognize the evolving Grammy audience. Inon Zur, a composer on dozens of prominent videogames such as Fallout: New Vegas and Dragon Age: Origins, hopes Grammy recognition will help videogame music gain respect from the "mainstream audience." We may not see a videogame music winner right away, but change has to start somewhere. Up the road, videogame composers will likely be recognized as highly as those working in film and television.